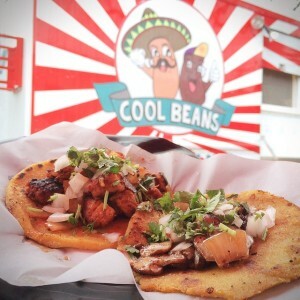 The Vegan Nom: Austin’s first all-vegan taco trailer has already carved quite a name for itself in the Austin vegan scene. 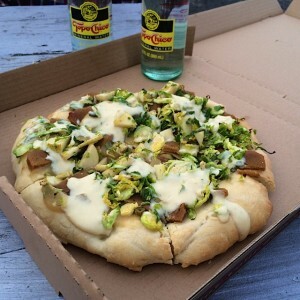 We once heard someone proclaim, “What angel blessed us with the Vegan Nom?” We totally agree. With homemade salsas and killer ingredient combinations, the Vegan Nom is not to be missed. Red Hot Vegans favorites include the Vegan Del Rey, the Rockin Vegan Migas, and the Vegan Jalisco. Bistro Vonish features a rotating menu made from local ingredients in season. Watch out for specials like the “Kolachnut” (Kolache Donut). 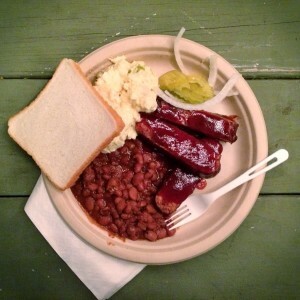 Cool Beans makes everything from scratch using organic ingredients and generations-old techniques. 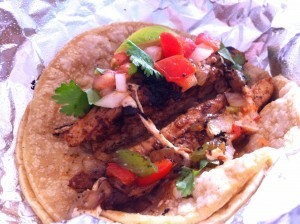 The end result is some of the freshest Latin food Austin has to offer, and it’s all vegan! 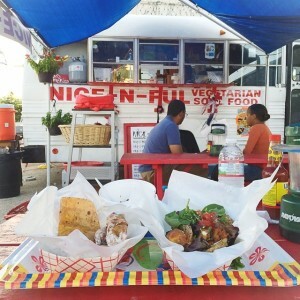 Nice-N-Ful is an all-vegetarian soul food trailer on E 11th street. Try the soul rolls (deep fried egg rolls with assorted soul food fillings)! Shhmaltz: Jewish deli style food options? Yes, please! 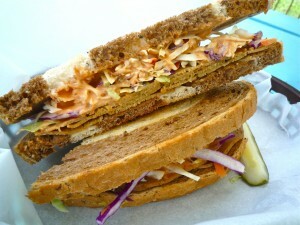 Take a recommendation from Yelp and order the Seitan Pastrami Reuben. Just hold the swiss to make it vegan. Bananarchy: Fans of Arrested Development will love with all of the fun TV show references on Banarachy’s menu. 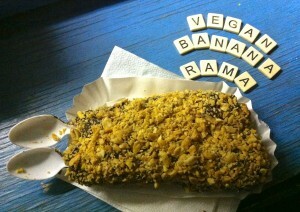 Try the Gob dipped in vegan chocolate. Don’t forget, there’s money in the banana stand. 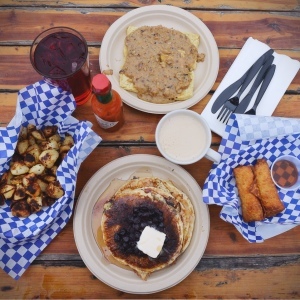 Golden Spike Rail Cart offers an all-vegan rotating menu of egg rolls, sandwiches, burritos, tacos, fries, and much more, as well as weekend vegan brunch. 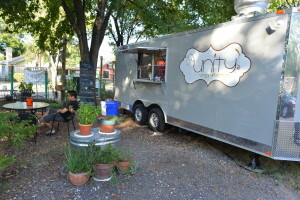 Unity Vegan Kitchen serves a variety of delicious vegan foods for lunch and dinner. Everything is from scratch, including fresh-baked rolls for their delicious sandwiches. 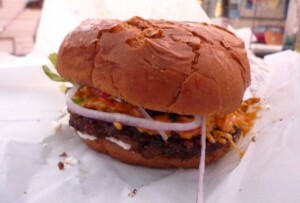 Arlo’s: The bac’n cheeze burger at Arlo’s is hailed as one of the best veggie burgers not only in town, but possibly ever. Yes, it’s that good. Once you’ve sampled this delicious treat, try out one of the several other menu options Arlo’s has to offer–they are good, too! Conscious Cravings (North Austin and South Austin): Hot wraps, cold salads, freshly made juices, and rosemary baked fries. Everything on the Conscious Cravings menu can be made vegan. Red Hot Vegans favorites include the pan-seared tofu and the chimichurri seitan. 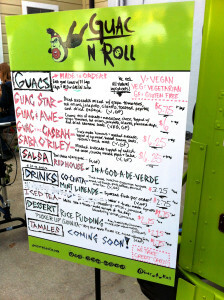 Guac N Roll (roving food truck): As Austin’s only roving veg food truck, Guac N Roll is something unique. They offer a delightful selection of guacamoles paired with chips, and fun drinks options to wash it all down. Check their website to see where to find them next. 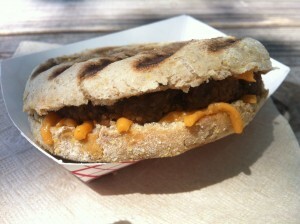 The Red Hot Vegans Guide to Austin Vegan and Vegetarian Food Trailers first appeared as the post “For the Love of Food Trailers” by Brittany. This guide was last updated on May 10th, 2015.